Since a given function can be declared several times in a program, there may be several FunctionDecls that correspond to that function. Only one of those FunctionDecls will be found when traversing the list of declarations in the context of the FunctionDecl (e.g., the translation unit); this FunctionDecl contains all of the information known about the function. Other, previous declarations of the function are available via the getPreviousDecl() chain. Definition at line 1737 of file Decl.h. Definition at line 2270 of file Decl.h. Definition at line 2269 of file Decl.h. Definition at line 1865 of file Decl.h. Definition at line 1864 of file Decl.h. Definition at line 1846 of file Decl.h. The kind of templated function a FunctionDecl can be. Definition at line 1744 of file Decl.h. Definition at line 2659 of file Decl.cpp. Definition at line 2572 of file Decl.h. Definition at line 2569 of file Decl.h. Definition at line 2565 of file Decl.h. Definition at line 2566 of file Decl.h. Definition at line 1874 of file Decl.h. Referenced by CreateNewFunctionDecl(), clang::Sema::DeclareGlobalAllocationFunction(), emitGlobalDtorWithCXAAtExit(), emitOutlinedFunctionPrologue(), clang::CodeGen::CodeGenFunction::generateBuiltinOSLogHelperFunction(), clang::CodeGen::CodeGenFunction::GenerateCopyHelperFunction(), clang::CodeGen::CodeGenFunction::GenerateDestroyHelperFunction(), clang::CodeGen::CodeGenFunction::GenerateObjCAtomicGetterCopyHelperFunction(), clang::CodeGen::CodeGenFunction::GenerateObjCAtomicSetterCopyHelperFunction(), getFunctionSourceLocation(), scanToNextArgument(), and clang::TemplateDeclInstantiator::VisitFunctionDecl(). Definition at line 4445 of file Decl.cpp. References clang::C, clang::XRayInstrKind::Function, and setHasWrittenPrototype(). Definition at line 4460 of file Decl.cpp. References clang::C, clang::XRayInstrKind::Function, and clang::SC_None. For a function declaration in C or C++, determine whether this declaration causes the definition to be externally visible. For instance, this determines if adding the current declaration to the set of redeclarations of the given functions causes isInlineDefinitionExternallyVisible to change from false to true. Definition at line 3159 of file Decl.cpp. Returns whether this specific declaration of the function has a body. Definition at line 1988 of file Decl.h. Referenced by clang::ASTRecordWriter::AddFunctionDefinition(), CheckAbstractClassUsage(), clang::Sema::DefineImplicitCopyAssignment(), clang::Sema::DefineImplicitCopyConstructor(), clang::Sema::DefineImplicitDefaultConstructor(), clang::Sema::DefineImplicitDestructor(), clang::Sema::DefineImplicitMoveAssignment(), clang::Sema::DefineImplicitMoveConstructor(), clang::Sema::DefineInheritingConstructor(), doesDeclarationForceExternallyVisibleDefinition(), clang::CodeGen::CodeGenModule::EmitGlobal(), clang::CXXMethodDecl::hasInlineBody(), IsDisallowedCopyOrAssign(), isInlineDefinitionExternallyVisible(), and clang::ASTNodeTraverser< Derived, NodeDelegateType >::VisitFunctionDecl(). The function body might be in any of the (re-)declarations of this function. The variant that accepts a FunctionDecl pointer will set that function declaration to the actual declaration containing the body (if there is one). NOTE: For checking if there is a body, use hasBody() instead, to avoid unnecessary AST de-serialization of the body. Definition at line 2744 of file Decl.cpp. References clang::LazyOffsetPtr< T, OffsT, Get >::get(), clang::Decl::getASTContext(), and hasBody(). Referenced by clang::ODRHash::AddFunctionDecl(), clang::ASTRecordWriter::AddFunctionDefinition(), clang::CodeGen::CodeGenFunction::EmitConstructorBody(), clang::CodeGen::CodeGenFunction::emitImplicitAssignmentOperatorBody(), endsWithReturn(), clang::CodeGen::CodeGenFunction::GenerateCode(), getMethodBody(), HandleConstructorCall(), clang::ento::ModelConsumer::HandleTopLevelDecl(), clang::if(), clang::ASTNodeImporter::ImportFunctionDeclBody(), clang::Sema::InstantiateFunctionDefinition(), clang::Sema::MarkFunctionReferenced(), and clang::ASTNodeTraverser< Derived, NodeDelegateType >::VisitFunctionDecl(). Definition at line 1972 of file Decl.h. The function corresponds to a built-in function if it is declared at translation scope or within an extern "C" block and its name matches with the name of a builtin. The returned value will be 0 for functions that do not correspond to a builtin, a value of type Builtin::ID if in the target-independent range [1,Builtin::First), or a target-specific builtin value. ConsiderWrapperFunctions If true, we should consider wrapper functions as their wrapped builtins. This shouldn't be done in general, but it's useful in Sema to diagnose calls to wrappers based on their semantics. Definition at line 3011 of file Decl.cpp. Referenced by clang::Sema::ActOnStartOfFunctionDef(), clang::Sema::AddKnownFunctionAttributes(), clang::Sema::BuildResolvedCallExpr(), clang::ASTContext::canBuiltinBeRedeclared(), clang::Sema::CheckEquivalentExceptionSpec(), checkFormatStringExpr(), checkOpenCLPipeArg(), clang::CodeGen::CodeGenFunction::checkTargetFeatures(), clang::Sema::ConvertArgumentsForCall(), clang::CodeGen::CodeGenFunction::EmitBranchOnBoolExpr(), EmitDirectCallee(), emitReplacement(), getAbsoluteValueFunctionKind(), clang::CallExpr::getBuiltinCallee(), getMemoryFunctionKind(), HasNonDllImportDtor(), clang::CallExpr::isBuiltinAssumeFalse(), clang::ento::CheckerContext::isCLibraryFunction(), and clang::Sema::UseArgumentDependentLookup(). Determine the type of an expression that calls this function. Definition at line 2323 of file Decl.h. Referenced by clang::consumed::ConsumedStateMap::operator!=(), clang::consumed::ConsumedAnalyzer::run(), and TryUserDefinedConversion(). Reimplemented in clang::CXXConversionDecl, clang::CXXDestructorDecl, clang::CXXConstructorDecl, and clang::CXXMethodDecl. Definition at line 2996 of file Decl.cpp. Referenced by checkRecursiveFunction(), clang::CodeGen::CGDebugInfo::completeUnusedClass(), clang::BodyFarm::getBody(), clang::CXXMethodDecl::getCanonicalDecl(), clang::CXXConstructorDecl::getCanonicalDecl(), clang::CXXDestructorDecl::getCanonicalDecl(), clang::CXXConversionDecl::getCanonicalDecl(), clang::FieldDecl::getFieldIndex(), isGlobal(), isInstantiationOf(), clang::FunctionProtoType::isTemplateVariadic(), clang::Sema::MarkFunctionReferenced(), clang::Sema::SetDeclDefaulted(), clang::Sema::SetDeclDeleted(), and clang::TemplateDeclInstantiator::VisitFunctionDecl(). Definition at line 2254 of file Decl.h. Retrieve the class scope template pattern that this function template specialization is instantiated from. Definition at line 3481 of file Decl.cpp. Referenced by getTemplateInstantiationPattern(), clang::Sema::InstantiateFunctionDefinition(), and isImplicitlyInstantiable(). Get the declared return type, which may differ from the actual return type if the return type is deduced. Definition at line 2312 of file Decl.h. Definition at line 1954 of file Decl.h. Referenced by getMethodBody(), and clang::Sema::InstantiateFunctionDefinition(). Definition at line 1960 of file Decl.h. Definition at line 3544 of file Decl.cpp. Referenced by clang::Sema::CheckOverload(), clang::ASTNodeImporter::ImportTemplateInformation(), clang::TemplateDeclInstantiator::VisitCXXMethodDecl(), clang::ASTDeclWriter::VisitFunctionDecl(), and clang::TemplateDeclInstantiator::VisitFunctionDecl(). Retrieves the function template that is described by this function declaration. Every function template is represented as a FunctionTemplateDecl and a FunctionDecl (or something derived from FunctionDecl). The former contains template properties (such as the template parameter lists) while the latter contains the actual description of the template's contents. FunctionTemplateDecl::getTemplatedDecl() retrieves the FunctionDecl that describes the function template, getDescribedFunctionTemplate() retrieves the FunctionTemplateDecl from a FunctionDecl. Definition at line 3371 of file Decl.cpp. Referenced by clang::Sema::AddOverloadCandidate(), clang::Sema::BuildLambdaExpr(), clang::Sema::CheckForFunctionRedefinition(), clang::Sema::CheckLiteralOperatorDeclaration(), clang::Sema::CheckMSVCRTEntryPoint(), CheckOperatorNewDeleteTypes(), clang::Sema::DeduceReturnType(), clang::Sema::DefineImplicitLambdaToFunctionPointerConversion(), clang::CodeGen::CodeGenFunction::EmitLambdaDelegatingInvokeBody(), clang::CXXRecordDecl::getGenericLambdaTemplateParameterList(), clang::Sema::IsOverload(), setPreviousDeclaration(), ShouldWarnAboutMissingPrototype(), clang::TemplateDeclInstantiator::VisitCXXMethodDecl(), clang::ASTDeclWriter::VisitFunctionDecl(), and clang::TemplateDeclInstantiator::VisitFunctionDecl(). Attempt to compute an informative source range covering the function exception specification, if any. Definition at line 3239 of file Decl.cpp. References clang::TypeLoc::getAs(), clang::FunctionTypeLoc::getExceptionSpecRange(), clang::TypeSourceInfo::getTypeLoc(), clang::DeclaratorDecl::getTypeSourceInfo(), and clang::TypeLoc::IgnoreParens(). If this function is an instantiation of a member function of a class template specialization, retrieves the function from which it was instantiated. The declaration for X<int>::f is a (non-templated) FunctionDecl whose parent is the class template specialization X<int>. For this declaration, getInstantiatedFromFunction() will return the FunctionDecl X<T>::A. When a complete definition of X<int>::A is required, it will be instantiated from the declaration returned by getInstantiatedFromMemberFunction(). Definition at line 3349 of file Decl.cpp. Referenced by adjustDeclToTemplate(), clang::Sema::CheckForFunctionRedefinition(), getExplicitVisibilityAux(), getODRHash(), getTemplateInstantiationPattern(), hasExplicitMemberDefinition(), clang::ASTNodeImporter::ImportTemplateInformation(), clang::Sema::InstantiateFunctionDefinition(), isInstantiationOf(), and isOutOfLine(). Definition at line 2911 of file Decl.cpp. getLiteralIdentifier - The literal suffix identifier this function represents, if any. Definition at line 3326 of file Decl.cpp. References clang::DeclarationName::CXXLiteralOperatorName, clang::DeclarationName::getCXXLiteralIdentifier(), and clang::NamedDecl::getDeclName(). If this function is an instantiation of a member function of a class template specialization, retrieves the member specialization information. Definition at line 3356 of file Decl.cpp. Referenced by getInstantiatedFromMemberFunction(), clang::ASTNodeImporter::ImportTemplateInformation(), clang::Sema::MarkFunctionReferenced(), clang::ASTDeclWriter::VisitFunctionDecl(), clang::ASTDeclReader::VisitFunctionDecl(), and clang::TemplateDeclInstantiator::VisitFunctionDecl(). Identify a memory copying or setting function. If the given function is a memory copy or setting function, returns the corresponding Builtin ID. If the function is not a memory function, returns 0. Definition at line 3658 of file Decl.cpp. References getBuiltinID(), clang::NamedDecl::getIdentifier(), isExternC(), and clang::IdentifierInfo::isStr(). Referenced by getPrintfFormatArgumentNum(), and getStrlenExprArg(). Returns the minimum number of arguments needed to call this function. getMinRequiredArguments - Returns the minimum number of arguments needed to call this function. This may be fewer than the number of function parameters, if some of the parameters have default arguments (in C++). This may be fewer than the number of function parameters, if some of the parameters have default arguments (in C++) or are parameter packs (C++11). Definition at line 3093 of file Decl.cpp. References clang::frontend::CPlusPlus, clang::Decl::getASTContext(), getNumParams(), and parameters(). Referenced by checkDirectCallValidity(), clang::Sema::DeduceTemplateArguments(), and clang::FunctionCallFilterCCC::ValidateCandidate(). Definition at line 1856 of file Decl.h. Gets the kind of multiversioning attribute this declaration has. Note that this can return a value even if the function is not multiversion, such as the case of 'target'. Definition at line 2959 of file Decl.cpp. References clang::CPUDispatch, clang::CPUSpecific, clang::None, and clang::Target. Definition at line 2694 of file Decl.cpp. References clang::TemplateArgumentList::asArray(), clang::NamedDecl::getNameForDiagnostic(), getTemplateSpecializationArgs(), and clang::printTemplateArgumentList(). Definition at line 1900 of file Decl.h. Referenced by getReturnTypeSourceRange(), clang::if(), SemaOpenCLBuiltinToAddr(), clang::TemplateDeclInstantiator::VisitCXXMethodDecl(), and clang::TemplateDeclInstantiator::VisitFunctionDecl(). Definition at line 1848 of file Decl.h. getNumParams - Return the number of parameters this function must have based on its FunctionType. This is the length of the ParamInfo array after it has been created. Definition at line 3072 of file Decl.cpp. References clang::C, clang::Type::getAs(), clang::FunctionProtoType::getNumParams(), and clang::ValueDecl::getType(). Referenced by AddFunctionParameterChunks(), clang::Sema::addLambdaParameters(), assumeNoOverflow(), AuditedType(), clang::Sema::CheckConstructor(), clang::Sema::CheckCXXDefaultArguments(), checkDirectCallValidity(), clang::Sema::CheckExplicitlyDefaultedSpecialMember(), CheckOperatorNewDeleteTypes(), clang::Sema::CheckOverloadedOperatorDeclaration(), convertArgsForAvailabilityChecks(), CopyObject(), decomposeTypeForEH(), clang::Sema::DeduceTemplateArguments(), clang::CodeGen::CodeGenFunction::EmitInheritedCXXConstructorCall(), emitReplacement(), evaluateCDTSize(), functionDeclHasDefaultArgument(), getMinRequiredArguments(), getNDSWDS(), clang::OverloadCandidate::getNumParams(), GetSignature(), hasCopyOrMoveCtorParam(), hasDefaultCXXMethodCC(), hasIdenticalPassObjectSizeAttrs(), isDestroyingOperatorDelete(), clang::Sema::isEmptyCudaConstructor(), clang::Sema::isInitListConstructor(), isNonPlacementDeallocationFunction(), isTypeSubstitutable(), clang::Sema::isUsualDeallocationFunction(), isVariadicFunctionTemplate(), clang::Sema::MarkDeducedTemplateParameters(), clang::Sema::PerformCopyInitialization(), llvm::FoldingSetTrait< AllocKind >::Profile(), ShouldWarnAboutMissingPrototype(), clang::FunctionCallFilterCCC::ValidateCandidate(), clang::TextNodeDumper::VisitFunctionDecl(), and visitLifetimeBoundArguments(). Returns ODRHash of the function. This value is calculated and stored on first call, then the stored value returned on the other calls. Definition at line 3764 of file Decl.cpp. References clang::ODRHash::AddFunctionDecl(), clang::ODRHash::CalculateHash(), and getInstantiatedFromMemberFunction(). Returns cached ODRHash of the function. This must have been previously computed and stored. Definition at line 3759 of file Decl.cpp. getOverloadedOperator - Which C++ overloaded operator this function represents, if any. Definition at line 3317 of file Decl.cpp. References clang::DeclarationName::CXXOperatorName, clang::DeclarationName::getCXXOverloadedOperator(), clang::NamedDecl::getDeclName(), and clang::OO_None. Referenced by clang::Sema::CheckOverloadedOperatorDeclaration(), clang::Sema::DefineImplicitCopyAssignment(), clang::Sema::DefineImplicitMoveAssignment(), DiagnoseShiftCompare(), clang::CodeGen::CodeGenFunction::EmitDeleteCall(), isDestroyingOperatorDelete(), clang::isLambdaCallOperator(), isNonPlacementDeallocationFunction(), and clang::CodeGen::CodeGenFunction::StartFunction(). Definition at line 2284 of file Decl.h. Referenced by clang::Sema::ActOnCXXDelete(), AddFunctionParameterChunks(), clang::Sema::addLambdaParameters(), assumeNoOverflow(), BuildImplicitBaseInitializer(), BuildImplicitMemberInitializer(), checkBuiltinArgument(), CheckConstexprParameterTypes(), clang::Sema::CheckConstructor(), clang::Sema::CheckCXXDefaultArguments(), clang::Sema::CheckLiteralOperatorDeclaration(), CheckOperatorNewDeclaration(), CheckOperatorNewDeleteTypes(), clang::Sema::CheckOverloadedOperatorDeclaration(), clang::Sema::CheckOverridingFunctionAttributes(), convertArgsForAvailabilityChecks(), CopyObject(), create_call_once(), create_dispatch_once(), create_dispatch_sync(), create_OSAtomicCompareAndSwap(), clang::Sema::DeduceTemplateArguments(), clang::Sema::DefineImplicitCopyAssignment(), clang::Sema::DefineImplicitMoveAssignment(), describeUninitializedArgumentInCall(), clang::CodeGen::CodeGenFunction::EmitCXXConstructorCall(), emitReplacement(), evaluateCDTSize(), functionDeclHasDefaultArgument(), clang::Sema::GatherArgumentsForCall(), getNDSWDS(), GetSignature(), HandleConstructorCall(), hasCopyOrMoveCtorParam(), isDestroyingOperatorDelete(), clang::Sema::isInitListConstructor(), isNonPlacementDeallocationFunction(), isTypeSubstitutable(), isVariadicFunctionTemplate(), clang::Sema::MarkDeducedTemplateParameters(), clang::Sema::PerformCopyInitialization(), clang::Sema::PerformImplicitConversion(), resolveBuiltinNewDeleteOverload(), clang::Sema::SpecialMemberIsTrivial(), and visitLifetimeBoundArguments(). Definition at line 2288 of file Decl.h. Retrieve the (first) point of instantiation of a function template specialization or a member of a class template specialization. the first point of instantiation, if this function was instantiated from a template; otherwise, returns an invalid source location. Definition at line 3619 of file Decl.cpp. Definition at line 1852 of file Decl.h. Retrieve the primary template that this function template specialization either specializes or was instantiated from. If this function declaration is not a function template specialization, returns NULL. Definition at line 3472 of file Decl.cpp. Referenced by clang::Sema::CheckLiteralOperatorDeclaration(), getTemplateInstantiationPattern(), isOutOfLine(), and isTemplate(). Definition at line 2301 of file Decl.h. Referenced by clang::Sema::ActOnFinishFunctionBody(), clang::ODRHash::AddFunctionDecl(), AuditedType(), clang::CodeGen::CodeGenFunction::BuildFunctionArgList(), clang::Sema::buildLambdaScope(), clang::Sema::CheckConstexprFunctionBody(), clang::Sema::CheckConstexprFunctionDecl(), completeFunctionType(), clang::CodeGen::CGDebugInfo::completeUnusedClass(), create_OSAtomicCompareAndSwap(), clang::Sema::DeduceReturnType(), clang::Sema::DeduceTemplateArguments(), clang::Sema::DefineImplicitLambdaToFunctionPointerConversion(), DiagnoseConstAssignment(), dumpMicrosoftThunkAdjustment(), evaluateCDTSize(), clang::comments::DeclInfo::fill(), clang::CodeGen::CodeGenFunction::GenerateCode(), getNDSWDS(), GetSignature(), GetTypeOfFunction(), HandleFunctionCall(), clang::Sema::InstantiateFunctionDefinition(), noteMemberDeclaredHere(), notePlausibleOverloads(), resolveBuiltinNewDeleteOverload(), TryRefInitWithConversionFunction(), and TryUserDefinedConversion(). Attempt to compute an informative source range covering the function return type. This may omit qualifiers and other information with limited representation in the AST. Definition at line 3219 of file Decl.cpp. References clang::TypeLoc::getAs(), clang::Decl::getASTContext(), clang::DeclarationNameInfo::getBeginLoc(), clang::SourceRange::getEnd(), getNameInfo(), clang::FunctionTypeLoc::getReturnLoc(), clang::ASTContext::getSourceManager(), clang::TypeLoc::getSourceRange(), clang::TypeSourceInfo::getTypeLoc(), clang::DeclaratorDecl::getTypeSourceInfo(), clang::TypeLoc::IgnoreParens(), clang::SourceManager::isBeforeInTranslationUnit(), clang::SourceLocation::isInvalid(), clang::SourceRange::isInvalid(), and SM. Definition at line 3654 of file Decl.cpp. Referenced by checkDirectCallValidity(), clang::Sema::CheckExplicitlyDefaultedSpecialMember(), clang::Decl::getBodyRBrace(), clang::Sema::MaybeSuggestAddingStaticToDecl(), resolveBuiltinNewDeleteOverload(), and clang::TemplateDeclInstantiator::VisitFunctionDecl(). Returns the storage class as written in the source. For the computed linkage of symbol, see getLinkage. Definition at line 2330 of file Decl.h. Referenced by clang::ODRHash::AddFunctionDecl(), canRedefineFunction(), clang::Sema::CheckForFunctionRedefinition(), clang::Sema::CheckMain(), CheckOperatorNewDeleteDeclarationScope(), clang::Sema::CheckOverridingFunctionAttributes(), getFunctionSourceLocation(), isGlobal(), clang::CXXMethodDecl::isStatic(), RedeclForcesDefC99(), redeclForcesDefMSVC(), clang::ASTDeclWriter::VisitFunctionDecl(), clang::TextNodeDumper::VisitFunctionDecl(), and clang::TemplateDeclInstantiator::VisitFunctionDecl(). What kind of templated function this is. Definition at line 3333 of file Decl.cpp. References TK_DependentFunctionTemplateSpecialization, TK_FunctionTemplate, TK_FunctionTemplateSpecialization, TK_MemberSpecialization, and TK_NonTemplate. Referenced by checkRecursiveFunction(), clang::ASTNodeImporter::ImportFunctionTemplateWithTemplateArgsFromSpecialization(), clang::ASTNodeImporter::ImportTemplateInformation(), isFunctionLocalClass(), clang::Sema::IsInsideALocalClassWithinATemplateFunction(), and clang::ASTDeclWriter::VisitFunctionDecl(). Retrieve the function declaration from which this function could be instantiated, if it is an instantiation (rather than a non-template or a specialization, for example). Definition at line 3431 of file Decl.cpp. References getClassScopeSpecializationPattern(), getDefinitionOrSelf(), getInstantiatedFromMemberFunction(), getPrimaryTemplate(), getTemplateSpecializationKind(), clang::isGenericLambdaCallOperatorSpecialization(), and clang::TSK_ExplicitSpecialization. Referenced by clang::CodeGen::CodeGenFunction::GenerateCode(), getDefiningModule(), GetSignature(), clang::Sema::InstantiateFunctionDefinition(), isImplicitlyInstantiable(), clang::Sema::SetDeclDefaulted(), and clang::CodeGen::CodeGenModule::SetLLVMFunctionAttributesForDefinition(). Retrieve the template arguments used to produce this function template specialization from the primary template. Definition at line 3492 of file Decl.cpp. Referenced by clang::ODRHash::AddFunctionDecl(), clang::Sema::DeduceReturnType(), clang::Sema::DefineImplicitLambdaToFunctionPointerConversion(), clang::CodeGen::CodeGenFunction::EmitLambdaDelegatingInvokeBody(), getNameForDiagnostic(), HandleConstructorCall(), isFunctionLocalClass(), and isTemplate(). Retrieve the template argument list as written in the sources, if any. Definition at line 3502 of file Decl.cpp. References clang::FunctionTemplateDecl::addSpecialization(), clang::FunctionTemplateSpecializationInfo::Create(), and clang::TSK_Undeclared. Referenced by clang::TemplateDeclInstantiator::VisitCXXMethodDecl(), and clang::TemplateDeclInstantiator::VisitFunctionDecl(). If this function is actually a function template specialization, retrieve information about this function template specialization. Definition at line 3486 of file Decl.cpp. Referenced by getExplicitVisibilityAux(), clang::if(), clang::ASTNodeImporter::ImportFunctionTemplateWithTemplateArgsFromSpecialization(), clang::ASTNodeImporter::ImportTemplateInformation(), isFunctionLocalClass(), clang::ASTDeclWriter::VisitFunctionDecl(), and clang::ASTNodeTraverser< Derived, NodeDelegateType >::VisitFunctionDecl(). Determine what kind of template instantiation this function represents. Definition at line 3575 of file Decl.cpp. References clang::FunctionTemplateSpecializationInfo::getTemplateSpecializationKind(), clang::MemberSpecializationInfo::getTemplateSpecializationKind(), and clang::TSK_Undeclared. Referenced by clang::Sema::CheckConstructor(), getTemplateInstantiationPattern(), clang::CodeGen::CodeGenModule::imbueXRayAttrs(), clang::ASTNodeImporter::ImportTemplateInformation(), clang::Sema::InstantiateFunctionDefinition(), isImplicitlyInstantiable(), isTemplateInstantiation(), and clang::Sema::MarkFunctionReferenced(). Returns true if the function has a body. The function body might be in any of the (re-)declarations of this function. The variant that accepts a FunctionDecl pointer will set that function declaration to the actual declaration containing the body (if there is one). Definition at line 2708 of file Decl.cpp. Referenced by AuditedType(), clang::cross_tu::CrossTranslationUnitContext::getCrossTUDefinition(), clang::CXXInstanceCall::getRuntimeDefinition(), clang::ento::ModelConsumer::HandleTopLevelDecl(), clang::ASTNodeImporter::ImportDeclParts(), clang::cross_tu::CrossTranslationUnitContext::importDefinition(), isImplicitlyInstantiable(), isOutOfLine(), and clang::CodeGen::CodeGenVTables::isVTableExternal(). Returns true if this Decl represents a declaration for a body of code, such as a function or method definition. Note that hasBody can also return true if any redeclaration of this Decl represents a declaration for a body of code. Definition at line 1932 of file Decl.h. Whether falling off this function implicitly returns null/zero. If a more specific implicit return value is required, front-ends should synthesize the appropriate return statements. Definition at line 2051 of file Decl.h. Referenced by clang::CodeGen::CodeGenFunction::GenerateCode(), and clang::ASTDeclWriter::VisitFunctionDecl(). Whether this function inherited its prototype from a previous declaration. Definition at line 2082 of file Decl.h. Referenced by clang::ASTDeclWriter::VisitCXXMethodDecl(), and clang::ASTDeclWriter::VisitFunctionDecl(). Whether this function has a prototype, either because one was explicitly written or because it was "inherited" by merging a declaration without a prototype with a declaration that has a prototype. Definition at line 2066 of file Decl.h. Referenced by clang::CodeGen::CGDebugInfo::completeUnusedClass(), EmitFunctionDeclPointer(), and isFunctionLocalClass(). True if the function was a definition but its body was skipped. Definition at line 2214 of file Decl.h. Referenced by clang::Sema::InstantiateFunctionDefinition(), and clang::ASTDeclWriter::VisitFunctionDecl(). Returns whether the function has a trivial body that does not require any specific codegen. Definition at line 2719 of file Decl.cpp. Referenced by CanSkipVTablePointerInitialization(), HasTrivialDestructorBody(), clang::Sema::isEmptyCudaConstructor(), clang::Sema::isEmptyCudaDestructor(), and clang::CodeGen::CodeGenModule::TryEmitBaseDestructorAsAlias(). Whether this function has a written prototype. Definition at line 2071 of file Decl.h. Referenced by clang::ASTDeclWriter::VisitCXXMethodDecl(), clang::ASTDeclWriter::VisitFunctionDecl(), and clang::TemplateDeclInstantiator::VisitFunctionDecl(). Whether the instantiation of this function is pending. This bit is set when the decision to instantiate this function is made and unset if and when the function body is created. That leaves out cases where instantiation did not happen because the template definition was not seen in this TU. This bit remains set in those cases, under the assumption that the instantiation will happen in some other TU. Definition at line 2102 of file Decl.h. Whether this is a (C++11) constexpr function or constexpr constructor. Definition at line 2093 of file Decl.h. Referenced by CheckConstexprFunction(), clang::Sema::CheckFunctionTemplateSpecialization(), clang::Sema::CheckMain(), CheckTrivialDefaultConstructor(), isImplicitlyDefinableConstexprFunction(), clang::Sema::MarkFunctionReferenced(), clang::Sema::maybeAddCUDAHostDeviceAttrs(), specialMemberIsConstexpr(), clang::TemplateDeclInstantiator::VisitCXXMethodDecl(), clang::ASTDeclWriter::VisitFunctionDecl(), and clang::TemplateDeclInstantiator::VisitFunctionDecl(). True if this function is a multiversioned dispatch function as a part of the cpu_specific/cpu_dispatch functionality. Definition at line 2969 of file Decl.cpp. True if this function is a multiversioned processor specific function as a part of the cpu_specific/cpu_dispatch functionality. Definition at line 2973 of file Decl.cpp. Whether this function is defaulted per C++0x. Only valid for special member functions. Definition at line 2033 of file Decl.h. Referenced by clang::ODRHash::AddFunctionDecl(), clang::Sema::AddMethodCandidate(), checkMoveAssignmentForRepeatedMove(), clang::Sema::DefineImplicitCopyAssignment(), clang::Sema::DefineImplicitCopyConstructor(), clang::Sema::DefineImplicitDefaultConstructor(), clang::Sema::DefineImplicitDestructor(), clang::Sema::DefineImplicitMoveAssignment(), clang::Sema::DefineImplicitMoveConstructor(), clang::CodeGen::CodeGenFunction::EmitConstructorBody(), EmitMemberInitializer(), clang::CodeGen::CodeGenFunction::GenerateCode(), HandleConstructorCall(), clang::Sema::InstantiateFunctionDefinition(), clang::Sema::isImplicitlyDeleted(), isMemcpyEquivalentSpecialMember(), PerformConstructorInitialization(), clang::Sema::SetDeclDefaulted(), clang::Sema::SetDeclDeleted(), TryValueInitialization(), clang::ASTDeclWriter::VisitFunctionDecl(), clang::TextNodeDumper::VisitFunctionDecl(), and clang::TemplateDeclInstantiator::VisitFunctionDecl(). The variant that accepts a FunctionDecl pointer will set that function declaration to the declaration that is a definition (if there is one). Definition at line 2733 of file Decl.cpp. Referenced by clang::Sema::CheckForFunctionRedefinition(), getMethodBody(), clang::CXXMethodDecl::hasInlineBody(), clang::TemplateDeclInstantiator::InitFunctionInstantiation(), clang::Sema::InstantiateFunctionDefinition(), clang::Sema::isEmptyCudaConstructor(), clang::Sema::isEmptyCudaDestructor(), clang::Sema::isUnavailableAlignedAllocationFunction(), clang::Sema::MarkFunctionReferenced(), and clang::Sema::PerformPendingInstantiations(). Definition at line 1948 of file Decl.h. Whether this function has been deleted. Definition at line 2135 of file Decl.h. Referenced by clang::ODRHash::AddFunctionDecl(), clang::Sema::AddMethodCandidate(), clang::Sema::DefineImplicitCopyAssignment(), clang::Sema::DefineImplicitCopyConstructor(), clang::Sema::DefineImplicitDefaultConstructor(), clang::Sema::DefineImplicitDestructor(), clang::Sema::DefineImplicitMoveAssignment(), clang::Sema::DefineImplicitMoveConstructor(), clang::Sema::DefineInheritingConstructor(), EvaluateUnaryTypeTrait(), clang::CXXRecordDecl::finishedDefaultedOrDeletedMember(), clang::TemplateDeclInstantiator::InitFunctionInstantiation(), clang::Sema::isImplicitlyDeleted(), clang::Sema::LookupSpecialMember(), clang::Sema::NoteDeletedFunction(), clang::Sema::SetDeclDeleted(), ShouldWarnAboutMissingPrototype(), TryValueInitialization(), and clang::TextNodeDumper::VisitFunctionDecl(). Definition at line 2139 of file Decl.h. Referenced by clang::ODRHash::AddFunctionDecl(), clang::TemplateDeclInstantiator::VisitCXXMethodDecl(), and clang::TextNodeDumper::VisitFunctionDecl(). Determine whether this is a destroying operator delete. Definition at line 2897 of file Decl.cpp. References clang::Type::getAsCXXRecordDecl(), getNumParams(), getOverloadedOperator(), getParamDecl(), clang::ValueDecl::getType(), and clang::Decl::isInStdNamespace(). Referenced by CheckOperatorDeleteDeclaration(), clang::CodeGen::CodeGenFunction::emitImplicitAssignmentOperatorBody(), EmitObjectDelete(), clang::CodeGen::CodeGenFunction::EnterDtorCleanups(), and getUsualDeleteParams(). Whether this function is explicitly defaulted per C++0x. Definition at line 2038 of file Decl.h. Referenced by clang::ODRHash::AddFunctionDecl(), clang::Sema::CheckExplicitlyDefaultedSpecialMember(), clang::TemplateDeclInstantiator::VisitCXXMethodDecl(), and clang::ASTDeclWriter::VisitFunctionDecl(). Whether this function is marked as explicit explicitly. Definition at line 2358 of file Decl.h. Determines whether this function is a function with external, C linkage. Definition at line 2915 of file Decl.cpp. Referenced by clang::Sema::CheckEquivalentExceptionSpec(), clang::Sema::CheckLiteralOperatorDeclaration(), getFunctionSourceLocation(), and getMemoryFunctionKind(). Determine whether this function is a function template specialization. Definition at line 2439 of file Decl.h. Referenced by clang::Sema::ActOnStartCXXMemberReference(), clang::CodeGen::CodeGenFunction::EmitLambdaDelegatingInvokeBody(), HandleConstructorCall(), clang::isGenericLambdaCallOperatorSpecialization(), and ShouldWarnAboutMissingPrototype(). Determines whether this is a global function. Definition at line 2927 of file Decl.cpp. References getCanonicalDecl(), clang::Decl::getDeclContext(), clang::DeclContext::getParent(), getStorageClass(), clang::DeclContext::isNamespace(), and clang::SC_Static. 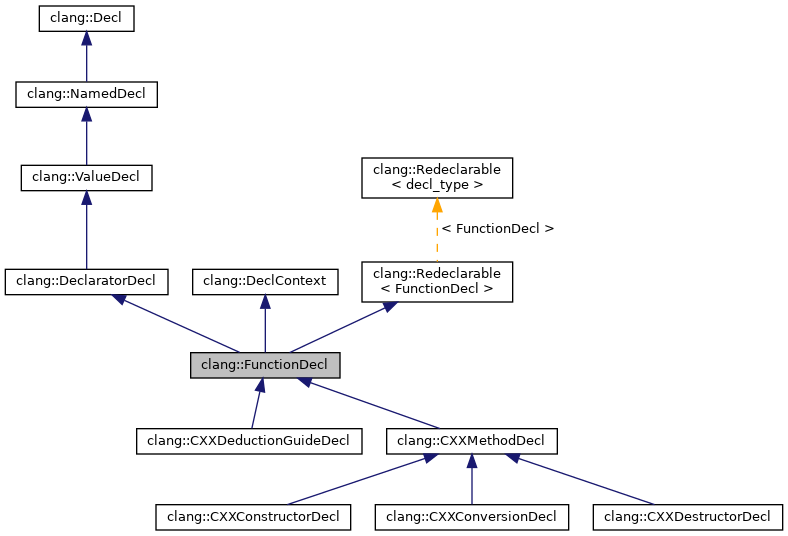 Referenced by ShouldWarnAboutMissingPrototype(), and clang::CallGraph::VisitFunctionDecl(). Determines whether this function is a function template specialization or a member of a class template specialization that can be implicitly instantiated. Definition at line 3379 of file Decl.cpp. References getClassScopeSpecializationPattern(), getTemplateInstantiationPattern(), getTemplateSpecializationKind(), hasBody(), isInlined(), clang::Decl::isInvalidDecl(), clang::TSK_ExplicitInstantiationDeclaration, clang::TSK_ExplicitInstantiationDefinition, clang::TSK_ExplicitSpecialization, clang::TSK_ImplicitInstantiation, and clang::TSK_Undeclared. Referenced by isImplicitlyDefinableConstexprFunction(), and clang::Sema::MarkFunctionReferenced(). Determines whether this function's context is, or is nested within, a C++ extern "C" linkage spec. Definition at line 2919 of file Decl.cpp. Determines whether this function's context is, or is nested within, a C++ extern "C++" linkage spec. Definition at line 2923 of file Decl.cpp. Determine whether this function should be inlined, because it is either marked "inline" or "constexpr" or is a member function of a class that was defined in the class body. Definition at line 2355 of file Decl.h. Referenced by clang::Sema::CheckForFunctionRedefinition(), clang::Sema::InstantiateFunctionDefinition(), clang::ento::CheckerContext::isCLibraryFunction(), isImplicitlyInstantiable(), isInlineDefinitionExternallyVisible(), isMSExternInline(), clang::Sema::MarkFunctionReferenced(), clang::CodeGen::CodeGenModule::SetLLVMFunctionAttributesForDefinition(), setPreviousDeclaration(), ShouldWarnAboutMissingPrototype(), useInlineVisibilityHidden(), clang::TemplateDeclInstantiator::VisitCXXMethodDecl(), clang::ASTDeclWriter::VisitFunctionDecl(), and clang::TemplateDeclInstantiator::VisitFunctionDecl(). For an inline function definition in C, or for a gnu_inline function in C++, determine whether the definition will be externally visible. Inline function definitions are always available for inlining optimizations. However, depending on the language dialect, declaration specifiers, and attributes, the definition of an inline function may or may not be "externally" visible to other translation units in the program. In C99, inline definitions are not externally visible by default. However, if even one of the global-scope declarations is marked "extern inline", the inline definition becomes externally visible (C99 6.7.4p6). In GNU89 mode, or if the gnu_inline attribute is attached to the function definition, we use the GNU semantics for inline, which are nearly the opposite of C99 semantics. In particular, "inline" by itself will create an externally visible symbol, but "extern inline" will not create an externally visible symbol. Definition at line 3268 of file Decl.cpp. References doesThisDeclarationHaveABody(), isInlined(), and willHaveBody(). Definition at line 2341 of file Decl.h. Referenced by clang::ODRHash::AddFunctionDecl(), canRedefineFunction(), clang::Sema::CheckForFunctionRedefinition(), clang::Sema::CheckMain(), computeKeyFunction(), RedeclForcesDefC99(), clang::TemplateDeclInstantiator::VisitCXXMethodDecl(), clang::ASTDeclWriter::VisitFunctionDecl(), clang::TextNodeDumper::VisitFunctionDecl(), and clang::TemplateDeclInstantiator::VisitFunctionDecl(). Whether this templated function will be late parsed. Definition at line 2012 of file Decl.h. Referenced by clang::Sema::ActOnStartOfFunctionDef(), clang::ODRHash::AddFunctionDecl(), clang::Sema::InstantiateFunctionDefinition(), and clang::ASTDeclWriter::VisitFunctionDecl(). Determines whether this function is "main", which is the entry point into an executable program. Definition at line 2773 of file Decl.cpp. References clang::TranslationUnitDecl::getASTContext(), clang::Decl::getDeclContext(), clang::ASTContext::getLangOpts(), clang::DeclContext::getRedeclContext(), and isNamed(). Referenced by getFunctionSourceLocation(), clang::Sema::IsOverload(), clang::Sema::SetDeclDeleted(), ShouldWarnAboutMissingPrototype(), and clang::CodeGen::CodeGenFunction::StartFunction(). The combination of the extern and inline keywords under MSVC forces the function to be required. Note: This function assumes that we will only get called when isInlined() would return true for this FunctionDecl. Definition at line 3109 of file Decl.cpp. Determines whether this function is a MSVCRT user defined entry point. Definition at line 2781 of file Decl.cpp. References clang::TranslationUnitDecl::getASTContext(), clang::Decl::getDeclContext(), clang::NamedDecl::getIdentifier(), clang::NamedDecl::getName(), clang::DeclContext::getRedeclContext(), clang::ASTContext::getTargetInfo(), and clang::TargetInfo::getTriple(). Referenced by clang::Sema::IsOverload(), and clang::CodeGen::CodeGenFunction::StartFunction(). True if this function is considered a multiversioned function. Definition at line 2224 of file Decl.h. Referenced by clang::ASTContext::forEachMultiversionedFunctionVersion(), clang::CodeGen::CodeGenModule::getLLVMLinkageForDeclarator(), getMangledNameImpl(), isBetterMultiversionCandidate(), isCPUDispatchMultiVersion(), isCPUSpecificMultiVersion(), isTargetMultiVersion(), clang::Sema::NoteOverloadCandidate(), and clang::ASTDeclWriter::VisitFunctionDecl(). Determines whether this function is known to be 'noreturn', through an attribute on its declaration or its type. Definition at line 2947 of file Decl.cpp. Referenced by clang::CodeGen::CGDebugInfo::completeUnusedClass(), and clang::CFGImplicitDtor::isNoReturn(). Determine whether this is or was instantiated from an out-of-line definition of a member function. Definition at line 3631 of file Decl.cpp. References getInstantiatedFromMemberFunction(), getPrimaryTemplate(), hasBody(), clang::Decl::isOutOfLine(), and isOutOfLine(). Referenced by clang::CXXMethodDecl::hasInlineBody(), isOutOfLine(), clang::TemplateDeclInstantiator::VisitCXXMethodDecl(), and clang::TemplateDeclInstantiator::VisitFunctionDecl(). Whether this function declaration represents an C++ overloaded operator, e.g., "operator+". Definition at line 2375 of file Decl.h. Referenced by clang::Sema::CheckOverloadedOperatorDeclaration(), clang::Sema::DefineImplicitCopyAssignment(), clang::Sema::DefineImplicitMoveAssignment(), DiagnoseShiftCompare(), and clang::TemplateDeclInstantiator::VisitFunctionDecl(). Whether this virtual function is pure, i.e. makes the containing class abstract. Definition at line 2008 of file Decl.h. Referenced by clang::ODRHash::AddFunctionDecl(), clang::CXXMethodDecl::getDevirtualizedMethod(), isFunctionLocalClass(), clang::CXXMethodDecl::isVirtual(), isVirtualCall(), clang::TemplateDeclInstantiator::VisitCXXMethodDecl(), clang::ASTDeclWriter::VisitFunctionDecl(), and clang::TextNodeDumper::VisitFunctionDecl(). Determines whether this function is one of the replaceable global allocation functions: void *operator new(size_t); void *operator new(size_t, const std::nothrow_t &) noexcept; void *operator new(size_t); void *operator new(size_t, const std::nothrow_t &) noexcept; void operator delete(void *) noexcept; void operator delete(void *, std::size_t) noexcept; [C++1y] void operator delete(void *, const std::nothrow_t &) noexcept; void operator delete(void *) noexcept; void operator delete(void *, std::size_t) noexcept; [C++1y] void operator delete(void *, const std::nothrow_t &) noexcept; These functions have special behavior under C++1y [expr.new]: An implementation is allowed to omit a call to a replaceable global allocation function. If this function is an aligned allocation/deallocation function, return true through IsAligned. Definition at line 2831 of file Decl.cpp. References clang::Type::castAs(), clang::Qualifiers::Const, clang::DeclarationName::CXXOperatorName, clang::Type::getAsCXXRecordDecl(), clang::Decl::getASTContext(), clang::QualType::getCVRQualifiers(), clang::DeclarationName::getCXXOverloadedOperator(), clang::Decl::getDeclContext(), clang::NamedDecl::getDeclName(), clang::ASTContext::getLangOpts(), clang::Type::getPointeeType(), clang::DeclContext::getRedeclContext(), clang::ASTContext::getSizeType(), clang::ValueDecl::getType(), clang::ASTContext::hasSameType(), clang::Type::isAlignValT(), clang::Decl::isInStdNamespace(), isNamed(), clang::QualType::isNull(), clang::Type::isReferenceType(), and clang::DeclContext::isTranslationUnit(). Referenced by clang::Sema::CheckEquivalentExceptionSpec(), clang::CodeGen::CodeGenModule::CreateFunctionTypeMetadataForIcall(), clang::CodeGen::CodeGenFunction::EmitCXXNewExpr(), EmitNewDeleteCall(), clang::Sema::isUnavailableAlignedAllocationFunction(), performTypeAdjustment(), resolveBuiltinNewDeleteOverload(), and clang::ento::ExprEngine::VisitCXXNewExpr(). Determines whether this operator new or delete is one of the reserved global placement operators: void *operator new(size_t, void *); void *operator new(size_t, void *); void operator delete(void *, void *); void operator delete(void *, void *); These functions have special behavior under [new.delete.placement]: These functions are reserved, a C++ program may not define functions that displace the versions in the Standard C++ library. The provisions of [basic.stc.dynamic] do not apply to these reserved placement forms of operator new and operator delete. This function must be an allocation or deallocation function. Definition at line 2808 of file Decl.cpp. References clang::Type::castAs(), clang::DeclarationName::CXXOperatorName, clang::Decl::getDeclContext(), clang::NamedDecl::getDeclName(), clang::DeclContext::getRedeclContext(), clang::ValueDecl::getType(), and clang::DeclContext::isTranslationUnit(). Referenced by CalculateCookiePadding(), clang::CodeGen::CodeGenFunction::EmitCXXNewExpr(), and clang::ento::ExprEngine::VisitCXXNewExpr(). True if this function is a multiversioned dispatch function as a part of the target functionality. Definition at line 2977 of file Decl.cpp. Determines if the given function was instantiated from a function template. Definition at line 3418 of file Decl.cpp. References getTemplateSpecializationKind(), clang::TSK_ExplicitInstantiationDeclaration, clang::TSK_ExplicitInstantiationDefinition, clang::TSK_ExplicitSpecialization, clang::TSK_ImplicitInstantiation, and clang::TSK_Undeclared. Referenced by clang::Sema::isEmptyCudaConstructor(), and clang::Sema::isEmptyCudaDestructor(). Returns whether this specific declaration of the function is also a definition that does not contain uninstantiated body. This does not determine whether the function has been defined (e.g., in a previous definition); for that information, use isDefined. Definition at line 1982 of file Decl.h. Referenced by clang::ODRHash::AddFunctionDecl(), clang::if(), clang::CallGraph::VisitFunctionDecl(), and clang::TemplateDeclInstantiator::VisitFunctionDecl(). Whether this function is "trivial" in some specialized C++ senses. Can only be true for default constructors, copy constructors, copy assignment operators, and destructors. Not meaningful until the class has been fully built by Sema. Definition at line 2025 of file Decl.h. Referenced by buildSingleCopyAssignRecursively(), checkMoveAssignmentForRepeatedMove(), CheckTrivialDefaultConstructor(), clang::CodeGen::CodeGenFunction::EmitCXXConstructorCall(), clang::CodeGen::CodeGenFunction::EnterDtorCleanups(), clang::Sema::FinalizeVarWithDestructor(), findTrivialSpecialMember(), clang::CXXRecordDecl::finishedDefaultedOrDeletedMember(), HandleConstructorCall(), clang::Expr::isConstantInitializer(), clang::Sema::isEmptyCudaConstructor(), clang::Sema::isEmptyCudaDestructor(), isMemcpyEquivalentSpecialMember(), isTrivialObjectAssignment(), clang::Sema::MaybeBindToTemporary(), PerformConstructorInitialization(), ShouldDiagnoseUnusedDecl(), clang::CodeGen::ConstantEmitter::tryEmitPrivateForVarInit(), clang::ento::ExprEngine::VisitCXXConstructExpr(), clang::ASTDeclWriter::VisitFunctionDecl(), and clang::TextNodeDumper::VisitFunctionDecl(). Definition at line 2028 of file Decl.h. Referenced by findTrivialSpecialMember(), clang::CXXRecordDecl::setTrivialForCallFlags(), and clang::ASTDeclWriter::VisitFunctionDecl(). Definition at line 2702 of file Decl.cpp. Referenced by AddFunctionParameterChunks(), canEmitDelegateCallArgs(), checkDirectCallValidity(), clang::Sema::CheckExplicitlyDefaultedSpecialMember(), checkVAStartIsInVariadicFunction(), clang::CodeGen::CGDebugInfo::completeUnusedClass(), convertArgsForAvailabilityChecks(), clang::CodeGen::CodeGenFunction::EmitCXXNewExpr(), clang::CodeGen::CodeGenFunction::EmitLambdaBlockInvokeBody(), clang::CodeGen::CodeGenFunction::EmitLambdaStaticInvokeBody(), GetSignature(), isImplicitThis(), clang::Sema::maybeAddCUDAHostDeviceAttrs(), llvm::FoldingSetTrait< AllocKind >::Profile(), and scanToNextArgument(). Whether this function is marked as virtual explicitly. Definition at line 1999 of file Decl.h. Referenced by clang::ODRHash::AddFunctionDecl(), clang::TemplateDeclInstantiator::InitMethodInstantiation(), clang::CXXMethodDecl::isVirtual(), clang::ASTDeclWriter::VisitFunctionDecl(), and clang::TextNodeDumper::VisitFunctionDecl(). Definition at line 2273 of file Decl.h. Referenced by AuditedType(), hasIdenticalPassObjectSizeAttrs(), clang::CodeGen::CodeGenFunction::StartThunk(), clang::TextNodeDumper::VisitFunctionDecl(), and clang::ASTNodeTraverser< Derived, NodeDelegateType >::VisitFunctionDecl(). Definition at line 2275 of file Decl.h. Definition at line 2272 of file Decl.h. Definition at line 2274 of file Decl.h. Referenced by AuditedType(), and clang::CodeGen::CodeGenFunction::StartThunk(). Definition at line 2276 of file Decl.h. Definition at line 2277 of file Decl.h. Referenced by clang::ODRHash::AddFunctionDecl(), clang::Sema::CheckLiteralOperatorDeclaration(), convertArgsForAvailabilityChecks(), create_call_once(), create_dispatch_once(), create_dispatch_sync(), create_OSAtomicCompareAndSwap(), and clang::ASTDeclWriter::VisitFunctionDecl(). Definition at line 2261 of file Decl.h. Referenced by clang::ODRHash::AddFunctionDecl(), clang::Sema::buildCoroutineParameterMoves(), clang::CodeGen::CodeGenFunction::BuildFunctionArgList(), canEmitDelegateCallArgs(), CheckNonNullArguments(), clang::Sema::CheckOverloadedOperatorDeclaration(), checkVAStartIsInVariadicFunction(), clang::CodeGen::CGDebugInfo::completeUnusedClass(), decomposeTypeForEH(), diagReturnOnAllocFailure(), clang::CodeGen::CodeGenFunction::EmitCallAndReturnForThunk(), clang::CodeGen::emitDeclareSimdFunction(), clang::CodeGen::CodeGenFunction::EmitLambdaDelegatingInvokeBody(), clang::comments::DeclInfo::fill(), functionHasPassObjectSizeParams(), getMinRequiredArguments(), getPackIndexForParam(), getStaticBooleanValue(), clang::if(), clang::ASTNodeImporter::ImportDeclParts(), isImplicitThis(), isOSObjectRelated(), clang::ento::AnyFunctionCall::parameters(), clang::consumed::ConsumedAnalyzer::run(), clang::TemplateDeclInstantiator::SubstFunctionType(), clang::Sema::SubstituteExplicitTemplateArguments(), treatUnusedNewEscaped(), clang::ASTDeclWriter::VisitFunctionDecl(), and clang::ASTNodeTraverser< Derived, NodeDelegateType >::VisitFunctionDecl(). Definition at line 2264 of file Decl.h. Definition at line 2754 of file Decl.cpp. Referenced by clang::Sema::ActOnFinishFunctionBody(), clang::Sema::DefineImplicitCopyConstructor(), clang::Sema::DefineImplicitDefaultConstructor(), clang::Sema::DefineImplicitDestructor(), clang::Sema::DefineImplicitMoveConstructor(), and clang::ASTNodeImporter::ImportFunctionDeclBody(). Definition at line 2094 of file Decl.h. Referenced by clang::Sema::CheckMain(), and clang::ASTDeclReader::VisitFunctionDecl(). Definition at line 2034 of file Decl.h. Referenced by clang::Sema::SetDeclDefaulted(), and clang::ASTDeclReader::VisitFunctionDecl(). Definition at line 2143 of file Decl.h. Referenced by clang::TemplateDeclInstantiator::InitFunctionInstantiation(), clang::Sema::SetDeclDeleted(), and clang::ASTDeclReader::VisitFunctionDecl(). Specifies that this function declaration is actually a dependent function template specialization. Definition at line 3533 of file Decl.cpp. Referenced by clang::Sema::CheckDependentFunctionTemplateSpecialization(), clang::ASTNodeImporter::ImportTemplateInformation(), and clang::ASTDeclReader::VisitFunctionDecl(). Definition at line 3375 of file Decl.cpp. Referenced by clang::ASTDeclReader::VisitFunctionDecl(), and clang::TemplateDeclInstantiator::VisitFunctionDecl(). State that this function is explicitly defaulted per C++0x. Definition at line 2044 of file Decl.h. State that this function is marked as explicit explicitly. Definition at line 2363 of file Decl.h. Specify that this function declaration is actually a function template specialization. Template the function template that this function template specialization specializes. TemplateArgs the template arguments that produced this function template specialization from the template. InsertPos If non-NULL, the position in the function template specialization set where the function template specialization data will be inserted. TSK the kind of template specialization this is. TemplateArgsAsWritten location info of template arguments. PointOfInstantiation point at which the function template specialization was first instantiated. Definition at line 2509 of file Decl.h. State that falling off this function implicitly returns null/zero. Definition at line 2058 of file Decl.h. Referenced by clang::Sema::CheckMSVCRTEntryPoint(), and clang::ASTDeclReader::VisitFunctionDecl(). State that this function inherited its prototype from a previous declaration. Definition at line 2088 of file Decl.h. Definition at line 2215 of file Decl.h. State that this function has a written prototype. Definition at line 2076 of file Decl.h. Referenced by Create(), and clang::ASTDeclReader::VisitFunctionDecl(). Flag that this function is implicitly inline. Definition at line 2350 of file Decl.h. Referenced by clang::Sema::SetDeclDeleted(), setPreviousDeclaration(), clang::ASTDeclReader::UpdateDecl(), clang::TemplateDeclInstantiator::VisitCXXMethodDecl(), clang::ASTDeclReader::VisitFunctionDecl(), and clang::TemplateDeclInstantiator::VisitFunctionDecl(). Set whether the "inline" keyword was specified for this function. Definition at line 2344 of file Decl.h. State that the instantiation of this function is pending. Definition at line 2108 of file Decl.h. Referenced by clang::Sema::InstantiateFunctionDefinition(), clang::Sema::MarkFunctionReferenced(), and clang::Sema::PerformPendingInstantiations(). Specify that this record is an instantiation of the member function FD. Definition at line 2416 of file Decl.h. Sets the multiversion state for this declaration and all of its redeclarations. Definition at line 2230 of file Decl.h. State that this templated function will be late parsed. Definition at line 2017 of file Decl.h. Referenced by clang::Sema::MarkAsLateParsedTemplate(), clang::Sema::UnmarkAsLateParsedTemplate(), and clang::ASTDeclReader::VisitFunctionDecl(). Definition at line 1993 of file Decl.h. Definition at line 2292 of file Decl.h. Definition at line 2982 of file Decl.cpp. References getDescribedFunctionTemplate(), isInlined(), setImplicitlyInline(), and clang::Redeclarable< FunctionDecl >::setPreviousDecl(). Definition at line 2760 of file Decl.cpp. References clang::DeclContext::FunctionDeclBits, clang::Decl::getDeclContext(), P, and Parent. Referenced by clang::Sema::CheckPureMethod(), and clang::ASTDeclReader::VisitFunctionDecl(). Definition at line 1907 of file Decl.h. Referenced by clang::Sema::CheckPureMethod(), clang::TemplateDeclInstantiator::VisitCXXMethodDecl(), and clang::TemplateDeclInstantiator::VisitFunctionDecl(). Sets the storage class as written in the source. Definition at line 2335 of file Decl.h. Definition at line 3592 of file Decl.cpp. References clang::Decl::getASTContext(), clang::Decl::getASTMutationListener(), clang::SourceLocation::isValid(), and clang::TSK_ExplicitSpecialization. Definition at line 2026 of file Decl.h. Definition at line 2029 of file Decl.h. Definition at line 2114 of file Decl.h. Referenced by clang::Sema::ActOnSEHTryBlock(), and clang::ASTDeclReader::VisitFunctionDecl(). State that this function is marked as virtual explicitly. Definition at line 2004 of file Decl.h. Referenced by clang::TemplateDeclInstantiator::InitMethodInstantiation(), and clang::ASTDeclReader::VisitFunctionDecl(). Definition at line 2221 of file Decl.h. Referenced by clang::Sema::ActOnFinishFunctionBody(), clang::Sema::ActOnStartOfFunctionDef(), clang::Sema::SetDeclDefaulted(), and clang::Sema::SetDeclDeleted(). Indicates the function uses __try. Definition at line 2113 of file Decl.h. Referenced by clang::CodeGen::EHPersonality::get(), clang::CodeGen::CodeGenFunction::StartFunction(), and clang::ASTDeclWriter::VisitFunctionDecl(). True if this function will eventually have a body, once it's fully parsed. Definition at line 2220 of file Decl.h. Referenced by clang::Sema::ActOnStartOfFunctionDef(), clang::Sema::DefineImplicitCopyAssignment(), clang::Sema::DefineImplicitCopyConstructor(), clang::Sema::DefineImplicitDefaultConstructor(), clang::Sema::DefineImplicitDestructor(), clang::Sema::DefineImplicitMoveAssignment(), clang::Sema::DefineImplicitMoveConstructor(), clang::Sema::DefineInheritingConstructor(), clang::CXXMethodDecl::hasInlineBody(), clang::Sema::InstantiateFunctionDefinition(), and isInlineDefinitionExternallyVisible(). Definition at line 1861 of file Decl.h. Definition at line 1862 of file Decl.h.